It is our belief that prayer is the manner with which we each speak to God. It is a means to have dialogue with that which we consider having greater power and influence over our lives. While meditation is how we can clear our minds and open our hearts to the inner voice dwelling deep within, prayer holds the participants ability to will his spirit in a way that speaks to the forces of life we call God. It is through the direction of this personal free will that we undertake and make the effort to pray. Many of those throughout history have undertaken efforts to pray only to be dismayed at the lack of response, affect, or change in life circumstances. They are told that when prayer is left unanswered it is not due to a lack of the confirmation that God or a greater power exists, but that circumstances within the individuals life need to be altered such as sin or karma. Therefore, we propose that response to prayer is not of great importance in the immediate moment of prayer. It is first significant that we find the courage to begin prayer. We look at prayer as the other half of a coin containing meditation on the flip side. The victory held and contained in prayer as well as meditation can be found in the effort to implement; that is the effort of directing ones free will toward answers to life’s questions outside of the realm of the laws and science of this world. Just as we can not measure the depth of ones love, we can not measure the importance or value of prayer. The farmer does not understand the workings of the seed and its DNA structure. He only relies upon his faith in understanding that through the planting of the seed, he can sustain the physical lives of himself and his loved ones. It is in the faith the farmer has in a single seed, that we encourage the practice of prayer just as that of meditation. The farmer understands that the seed will not bear fruit in a single day. It is through the continual efforts which the farmer directs in the sustaining of the plant’s growth in which fruit is rewarded. It is with this faith of things unknown that the farmer relies. We each need to refrain from looking for immediate results or responses to our efforts in prayer. In this attempt for immediate results we are truly deaf to the language of the heart, the dialogue of the soul. We must understand that we cannot only listen with our ears. We need to hear and trust in the silent words of faith. We need to have the faith of the farmer to rely on his daily and consistent efforts. It is through consistency of practice we must rely. Thus through the continued efforts to express our will through prayer do we find the unfolding of the great majesty of life. There is far more available to us in this world than meets the eye. Take the time to sit quietly and discover the beauty and magic within. To do this, we must first quiet the mind and open the heart. Listen to the voice of the heart. It speaks in a very different language, a language that cannot be heard with the ears, but only with the heart. This is the language of God. God listens to our hearts and that which emanates from it. With an open heart we become like the farmer with his seeds. The mystery of life then travels from our heart and into our prayer. Our prayers then take flight and our journey through life now just begins. We discover that we have never been alone. We discover that we have always been loved. We become aware of the beauty and magic of God and how our spirit has always been one with His Spirit. If we would only be persistent in letting go and finding the trust held in hope. Silently listen and quietly observe the lasting value waiting deep within the wings of the heart. Hope then fulfills its unspoken promise through God’s loving embrace. 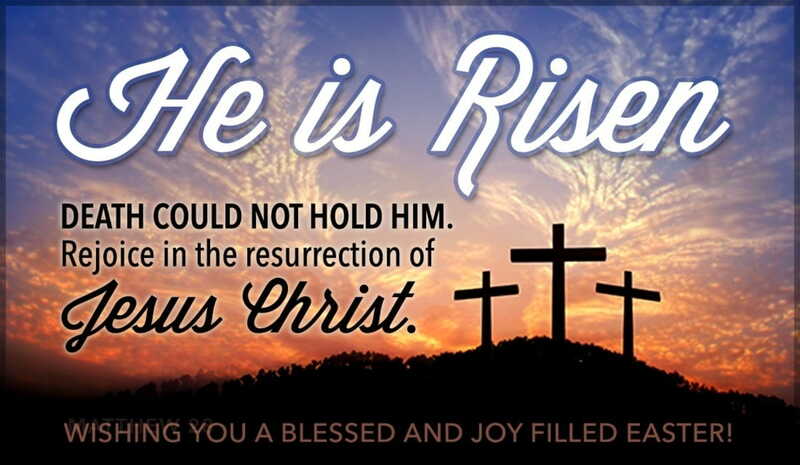 Easter is the celebration and remembrance of the resurrection of Jesus Christ on the third day after his crucifixion. You can read more about the meaning, origin and history of the holiday on our article What is Easter? Lord, death could not hold You. And because of You, the resurrection, we, too, can live. Thank You that the grave is only a journey into the presence of God. You have removed the sting of death and empowered this thing called life. Now I will live in Your presence forever. Amen. Dear Lord, may I realize afresh today what Your death and resurrection mean for me. Forgiveness … Freedom … and the ability to walk with You through this fallen world into eternity. May I always find my satisfaction in You and Your willingness to offer Yourself to me. In Jesus’ Name, Amen.